Pierate - Pie Reviews: Will the Wycombe pies be a phat lot of good?! It’s a tough job keeping track of all the comings and goings in football’s summer transfer window, especially with the distraction of the World Cup (and our World Cup pie blog) this summer! But one transfer we Pierateers did spot was a change in the pie supplier at Wycombe Wanderers FC, who are the local club of the Pierateers. As you may well know, the Pierateers have rated pies in grounds up and down the country and are looking to expand the number of pies in their Pieremiership table! 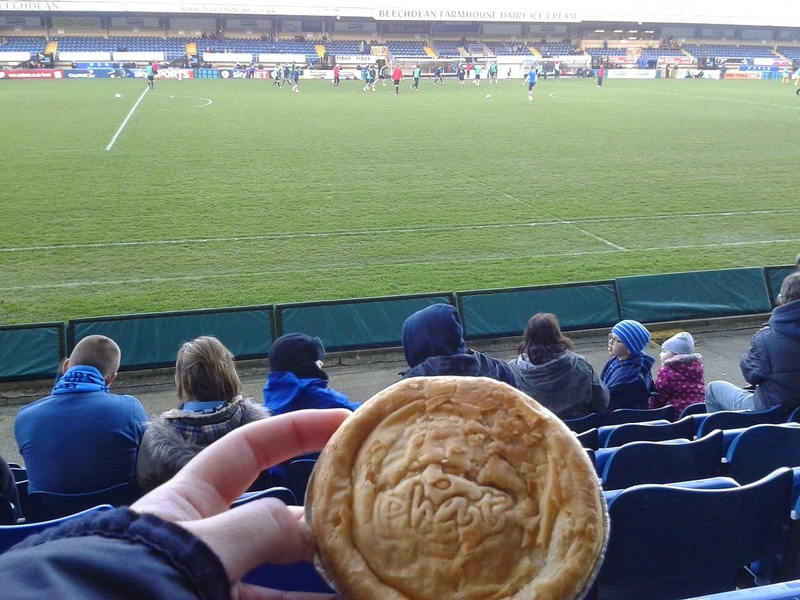 But in amongst all this, having already rated last season’s pie at Wycombe, we rated the new offering at Adam’s Park – made by Phat Pasty Co. who we also rated at Portsmouth FC – as Wycombe Wanderers took on Southend United. Would they hit the back of the net?! First things first, let’s remind ourselves that a football pie is one of the hardest pies to get right. And we should know – having been pie advisers to the BBC just a few months ago and even featuring in a video on the BBC Sport website as part of their “Pies of Football” review. Not only do we want tasty pastry and a fabulous filling, but the pie needs to be able to be eaten by hand and have a not-too-runny consistency to save spills on your football shirt! It can also be difficult to get value for money when in a sports arena, but we take that into account when looking at the cheapness. The steak and potato pie by Phat Pasty Co certainly looked appealing, with a good depth to it and cleverly including the word “phat” into the top pastry. However when Pierateer RAS went to take his pie out of the foil, there was a monumental collapse of the pastry, resulting in the lid and parts of the side being completely separated from the rest of the pie. The weight of the pie seemed too strong for the pastry to hold, which was rather surprising given the thickness of the pastry. What seemed to be the issue here was that the pastry was thick and the capacity very strong, but the pastry is not crisp and firm enough to hold the weight properly. This may be partly due to the cooking technique for a football ground, in a deep foil casing, but if it being sold at a football ground it does really need to hold the contents better to get a good score from us. Unfortunately neither of the Phat Pasty Co pies we've had at football grounds have matched the colour and crispy looking texture of the pies on the Phat Pasty Co pie website page. The content itself was on the whole pretty good, though it was noted that a meat pie – rather than meat and potato – would most probably have scored higher. The potato in this pie though was cooked well, and nice and flavoursome. There could have certainly been a bit more meat and there was a bit of chewy meat in there, but overall the flavour of the filling was enjoyed. The capacity was pretty much spot on and at £3 for a pie, that’s pretty good value for a hot pie of that size eaten out. 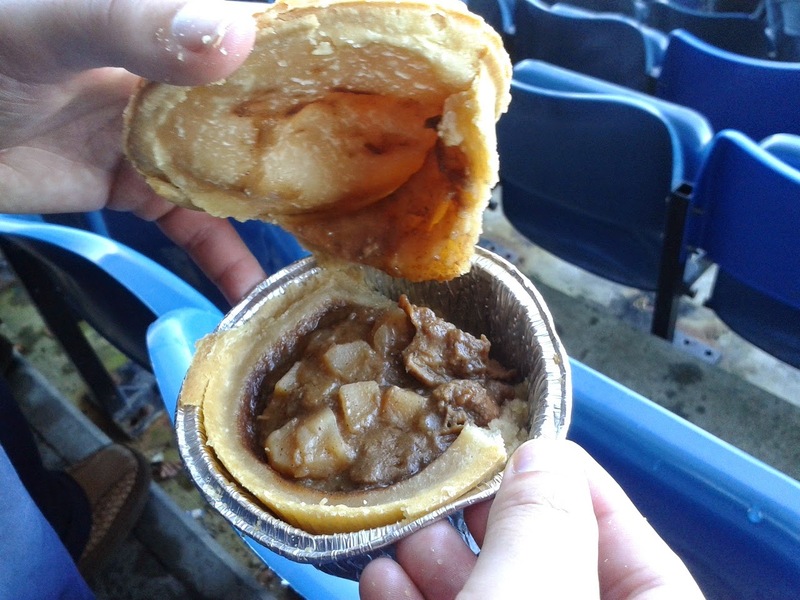 Our post match summary then: While we commend a big meat and potato pie with an enjoyable filling, the pastry on this pie sadly wasn’t strong or tasty enough for top marks. It was too thick and still tasted quite floury. For a football pie, the pastry didn’t hold together well enough to pick it up and eat it, so a longer baked and stronger pie pastry would be ideal.